Thank you for your time in considering my personal invitation to partner with me in doTERRA to build a long-term residual income. Essential Oils are part of my everyday life. Because they are completely natural, toxin free and they smell incredible. Since going toxin free over four years ago, I now blend my own moisturiser, serum, toner and non-toxic sunscreen. I use essential oils in place of pharmaceuticals for colds, viruses, headaches, hormonal imbalances, adrenal fatigue, nausea and digestive issues. I diffuse to help me focus, spark creativity, calm emotions, ground my energy and help me sleep. I have never once used a pharmaceutical drug on my child; despite viruses, ear infections, colds, gastro, sick tummy and waking through the night. There is truly an oil for everything, and they work! Everytime. I have replaced all the chemicals in my home with non-toxic cleaning products, eliminated all bathroom cabinet chemicals and even my perfumes went into the trash (super disruptive to your hormones ladies). I now make natural perfumes using the oils. In fact, by 2020 the Essential Oil industry will be worth $20 billion dollars. It’s a perfect time for you to enter into this fast-growing trend and capitalise on the incredible growth we are experiencing. I can't wait to welcome you into our community and help you walk this beautiful journey as you in turn support your followers to take control of their own health and happiness. When you order your kit you are invited to join our private global community, Path To Wellness. You will learn how to use your oils, replace your toxic cleaning products, create all-natural skin care products, strengthen your emotional health, balance your hormones, create a powerful natural medicine cabinet for your family, feel calm and stress-free and so much more... ask any questions you like, we are here to serve you! Click here to go to my DoTERRA website. Click 'Join & Save' in the menu up top. On the next page select your preferred language and which country your products will be shipped to. > If your country is not listed, please contact me here. > If you are in Europe select this and a drop down list will show for you to select which country. > Another screen may show asking you if you would like Local (OTG) Order or an International (NFR) Order. Select Local (OTG) Order. It's time to enter in your personal details. The lines marked with an * are required. Choose your ‘time zone,’ that is your current location. Be mindful of the birth date section as it is in US format (m/d/y). (If you chose Wellness Advocate we recommend you do include your tax information if asked, but this can be done later so no problem to leave it. Also check with your accountant as you may be able to claim your kit and monthly order as a business expense). Leave the section marked ‘sponsor ID’ and 'enroller ID'. It should have my number (5430413) and this means I will be your contact and support for any questions you have. In the next section, it’s time to place your first order! Both of these will give you the Top 10 oils every person needs and our membership site will show you over 101 ways you can use these for yourself and in your home. If you ordered a kit, you will want to add Fractionated Coconut Oil (which is essential for applying the oils to your body). Click the area to 'add items' to your cart. Click to open up the Price List and find your item. Copy the description or code and enter into your cart. It’s important to click on the button ‘view totals’ below your shopping cart. Enter your billing address (alternatively tick the box stating the shipping and billing addresses are the same). Choose your payment method in the menu ‘payment.’ I recommend credit card as it's easier and you receive your gorgeous oils more quickly. After you’ve chosen your payment method, you can choose to save your payment information for your next order by clicking the corresponding box. It will ask you for your card information. When entered click ‘process order’ to complete the process. If all went well, you’ll now see a confirmation of your registration and of your first order on the screen. 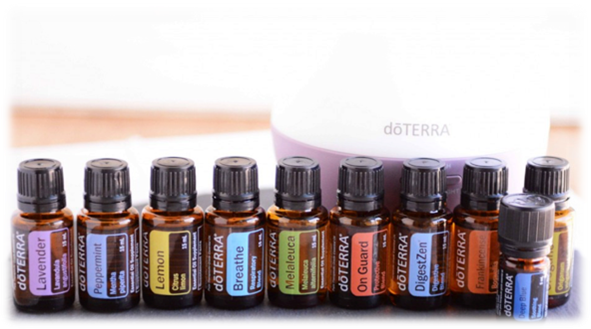 It will now ask if you would like to set up your 'LRP' which is DoTERRA's Loyalty Rewards program. You are welcome to go ahead and set up your next monthly order; or leave this until you come into our community and learn more about the membership program, benefits and oils. If you have any questions about your registration with dōTERRA or your first order, get in touch here. Your welcome email is on it's way!